If the creators of the next Pirates of the Caribbean game had shown me the game's ship combat, I might not have been looking at their game and thinking "Fable clone." Not that a Fable clone would be bad. In looks and in some manners of the land-based parts of its game design, Pirates of the Caribbean: Armada of the Damned resembles the esteemed action-adventure series on the Xbox 360. With ships, Pirates will surely be able to establish its own identity. But at E3 2010, I didn't get to see the game's customizable pirate ships and the ship-to-ship combat. Instead, what Propaganda Games (Turok) and Disney were showing a E3 last week was the land portion of the game. 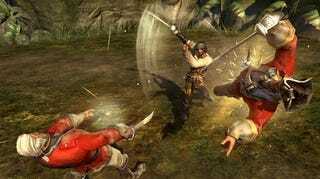 Pirates is, like Fable, an action-RPG, which these days means that you play it with the button-mashing of an action game but can expect your character's abilities to branch and morph in some ways. The main branching involves the type of pirate you control in this prequel to the famous movie series. You can be a Legendary pirate, an agile swashbuckler seen in the top shot of this post. Or you can be a Dreaded pirate as seen in the shot to the left here, a powerhouse with a hard edge. They represent the poles of Pirates' morality system and they affect how some quests will unfold. For example, a developer told me, a Legendary pirate might need to disguise himself and trick his way into a ballroom. A Dreaded pirate might instead need to bombard the palace containing that ballroom with cannons shot from his ship. I was shown some combat enacted by a developer-controller pirate on a volcanic island. We were on a quest, but I was in a rush, so I just watched a bit of battle against some enemies. When they were hit, enemies sweated hit points. When they were cursed — sort of a pirate form of magic, limited to a few spells at a time — the target enemy was debuffed, losing resistance to damage. If a player hits a finishing move on a cursed enemy, the curse spreads to adjacent enemies. I didn't get to look at Pirates of the Caribbean for very long, but what a saw was a surprisingly aggressive action game built in the fashion of the Fable series that I like very much. Marry that with pirate ship combat, and the results could be quite nice. Pirates of the Caribbean: Armada of the Damned ships in the fall for the PS3 and Xbox 360.